Experiencing a low pressure water problem or no water at all? These could be any of various problems in your water system, from well pump to electrical to piping to pressure tank and more. Action has the tools and experience to resolve residential or commercial water system problems. Call us for all your well pump and water problems. When you have no water, and because all no-water calls are different, Action will arrive at your home or business fast to diagnose the cause of your no-water problem. We’ll find the best cost-effective way to deal with the trouble using quality replacement parts, wire, and pumps. 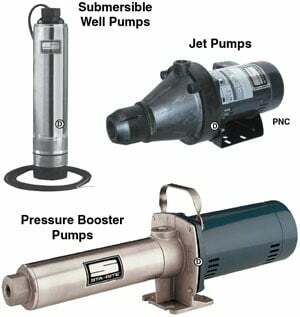 We service all makes and models of pumps and all makes of pressure tanks. Should we need to replace equipment in the well, we also perform chlorination procedures to help insure clean well equipment and safer water. Action stands behind the products we sell for the limited warranty period of the product and offers a one-year limited warranty on labor. Water quality for homeowners or commercial businesses can be not only a problem but also a health hazard. If you suspect water quality problems, due to illness, water discoloration, or unusual odors, call Action immediately for water sampling. We work with the State Lab of Hygiene, to determine the quality of your water. Should your water report indicate unsafe levels of nitrates bacteria or other unhealthy substances we will work with you to determine the trouble and correct it. So you have drinking water for your family or employees that is safe and pure. We recommend water sampling on a yearly basis as an excellent way to protect your family from the ever-changing conditions and quality of your personal drinking water. Whether selling or buying a home with a private well, you want to be assured that the well is safe and functions properly. Action can give you a full pressure system inspection, including water sample testing. We’ll work with you, the customer, or the lender to provide complete and correct paperwork for a smooth home sale transition.